Chapman University’s Office of Undergraduate Research and Creative Activity is thrilled to honor Dr. Christopher Kim and Dr. Jocelyn Buckner as the recipients of the first annual Award in Mentorship of Undergraduate Research and Creative Activity. This prestigious new award recognizes an outstanding senior and junior faculty members whose exceptional mentorship have supported student research and creative activity, enriching undergraduate students’ lives in and beyond the classroom. These awards typify Chapman University’s mission to provide personalized education of distinction, and they honor faculty for providing high-impact learning experiences to Chapman University students. Dr. Christopher Kim working with SURFEES fellow. Dr. Christopher Kim, the recipient of the Mentorship Award for full-time faculty with tenure, has made significant contributions to student research activities on campus. Kim has served as the director the Office of Undergraduate Research and Creative Activity and mentors a wide range of students each semester, many of whom have received scholarly and creative grants for their work. 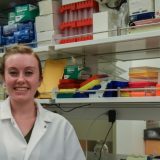 Moreover, Kim mentors community college students annually as part the NSF-REU grant sponsored program SURFEES (Summer Undergraduate Research Earth Environmental Science). 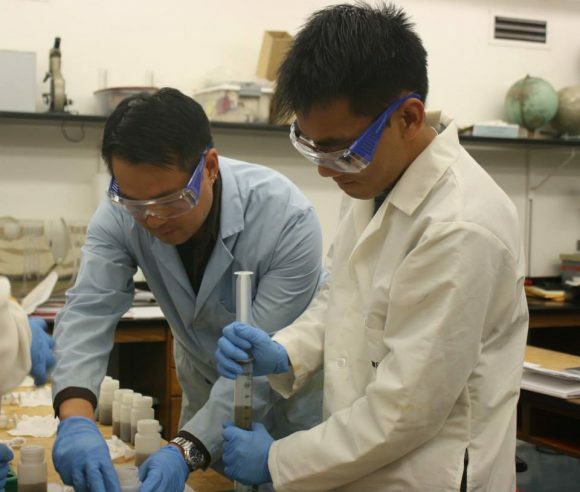 When he isn’t mentoring students, he pursues his own research in trace metal in mine wastes and toxic metals in contaminated soils and sediments. Dr. Jocelyn Buckner speaking with student at Faculty Research Expo. Dr. Jocelyn Buckner, the recipient of the Mentorship Award for full-time faculty without tenure, has also shaped the lives and careers of Chapman University students. 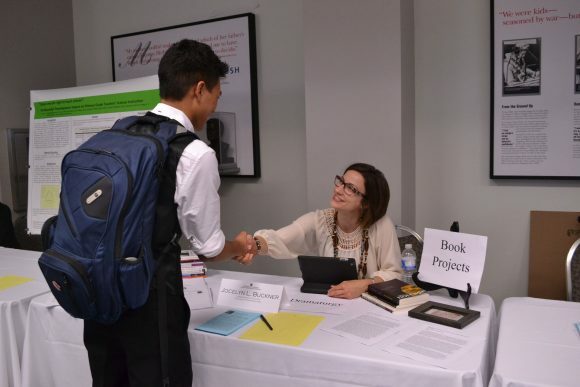 Each semester, Buckner mentors a variety of students, many of whom have received scholarly and creative grants for their work. 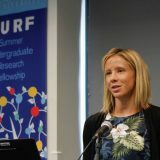 In addition, she has guided students through the annual SURF program, a unique opportunity that allows undergraduate students to pursue research and creative activity during an intensive eight-week period. In the fall, Buckner’s entire class participates in Chapman University’s semi-annual Student Research Day. 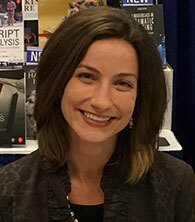 When she’s not mentoring students, Buckner’s research focuses on issues of identity and materialism in theatre and popular entertainment from the 19th to 21st centuries. She is the editor of A Critical Companion to Lynn Nottage (Routledge, 2016), the first scholarly publication dedicated to this playwright’s amazing work. Dr. Christopher Kim and Dr. Jocelyn Buckner received the Award in Mentorship of Undergraduate Research and Creative Activity on Friday, May 12th, 2017, as part of the annual faculty awards ceremony. For more information about the many opportunities available to Chapman University students and faculty, visit Office of Undergraduate Research and Creative Activity’s website. SURF Fellow Danielle Grainger ('17) uses qualitative methods to understand young adults and substance abuse. - How can prevention programs grow using the voices of recovered young adults? Center for Undergraduate Excellence is thrilled to announce the Fall 2017 Grant Recipients! 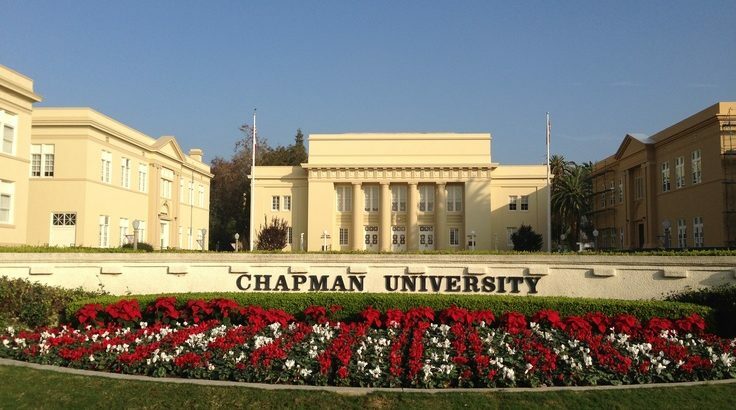 - Discover the exciting undergraduate research and creativity going on at Chapman University!